Great home on small acreage in SE Bend! Horse property or hobby farm or simply elbow room w/ peak-a-boo Mountain views. Property boasts a large shop w/bonus living space & 220 power, detached triple garage, barn & pond. Vaulted ceilings w/ massive living room windows providing tons of natural light to a spacious & open great room. Gas burning fireplace w/Deschutes river rock backdrop. Loft area provides endless possibilities & overlooks the living area. Country kitchen w/huge working island & a pastoral view. Main level Master Ste w/ french doors, tons of windows, walk in tile shower & claw foot tub. Additional 3 bedrooms PLUS Office space upstairs w/central bonus area. Wrap around covered deck for year round enjoyment. Partial unfinished basement offers plenty of storage! 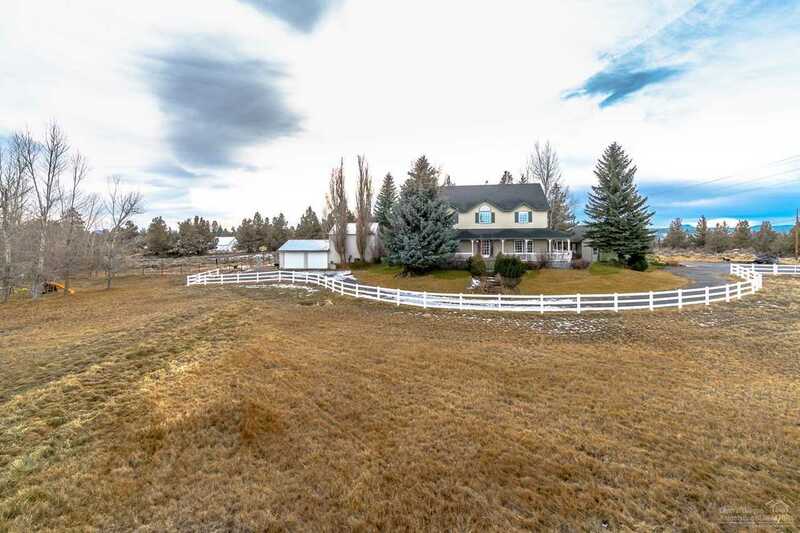 Fully fenced w/ 4 acres of Arnold irrigation. Bring your critters & toys! I was searching for a Property and found this listing (MLS #201900737). I would like to schedule a showing for 21735 Coyote Drive Bend, OR 97702. Thank you! I was searching for a Property and found this listing (MLS #201900737). Please send me more information regarding 21735 Coyote Drive Bend, OR 97702. Thank you!